It is generally acknowledged that the Israeli settlers in the West Bank live in relative affluence when compared to their Palestinian neighbours. 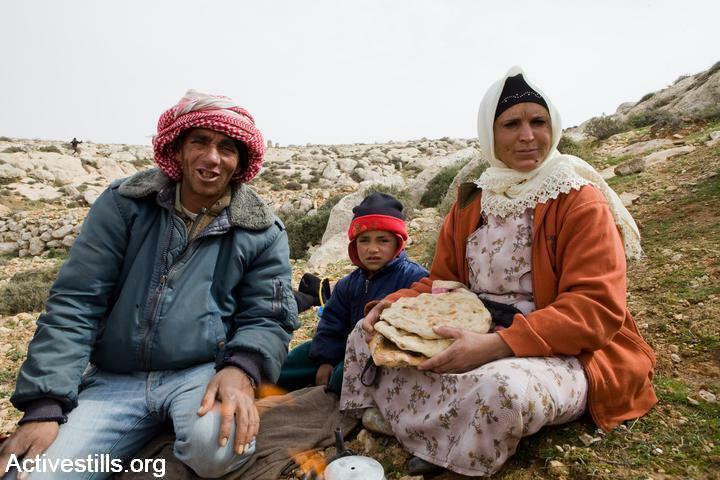 Yet nowhere becomes this contrast more apparent than in the case of the Southern Hebron Hills, an area considered to be one of the poorest of the whole West Bank and constituting the home of several thousand farmers and shepherds. The documentation of the presence of those communities dates back to the 1830s, it is however likely that they have actually been dwelling there for centuries. South Mount Hebron is rich in natural caves, used by the local communities for housing, as well as for sheltering their flocks. Throughout the time, they have dug additional caves near wells and farmland and also set up temporary and permanent dwellings. Their livelihoods rely primarily on farming and raising sheep and goats, and on the production of milk and cheese, with the bulk of the produce being used for home consumption and the rest being sold in the surrounding villages. Due to a lack of paved roads leading to and from their residential areas, the communities are compelled to walk, travel by horse or donkey, or by tractor and off-road vehicles. The villages are also not connected to a power grid, to telephone lines or a running-water system. For education and health care, the communities are obliged to travel to the surrounding villages. During the 1970s the Israeli government declared a large part of the area, approximately 30,000 dunums of land, as a closed military area. This was of no consequence until 1999 when military forces started to confiscate personal belongings, sealed caves, destroyed wells, as well as temporary structures and finally expelled the residents and prohibited their return. The closing of the area is being justified on two major grounds, one of which is the supposed need for the area to be used for military training purposes, and the second one being that the communities are only living on the land on a seasonly basis; hence due to the fact that they are spending half of the year in the nearby villages, they cannot be referred to as “residents” of the area. With the assistance of the Association of Civil Rights in Israel (ACRI), some of the families petitioned against their expulsion at the High Court of Justice, which in turn filed a temporary injunction and allowed the residents to return to the area until a final conclusion would be reached. Following Israeli human rights organisation B'Tselem, the real motives behind the closing of the area is the intended annexation of the land, which is closely located to the Green Line. In the beginning of the 1980s, Israel started building an increasing number of settlements in the area, which were followed by the setting up of outposts. B'Tselem notes that while many of the housing units and structures were built without official approval by the government, they however continue to be subsidised by government ministries. The increase of land appropriation for the expansion of the settlements was followed by a deterioration of the relations between the local communities and the settlers and Israeli authorities. 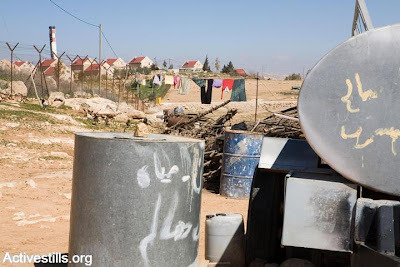 The communities are increasingly being subjected to different forms of abuse by the settlers, including property damage, the destruction of crops and theft of sheep and goats, as well as by varying forms of intimidation and physical violence. Like in the rest of the West Bank, the Israeli authorities, theoretically obligated to protect both the Palestinian and the Israeli residents, usually stand by, or defend and protect the settlers. According to the communities, until relatively recently, their living conditions and their struggle were ignored by official bodies and organisations, including Palestinian ones. Only in more recent years did Israeli and international activists start to regularly visit them and to support their fight to remain on their lands. Also Palestinian, Israeli and international organisations started to pay attention to the situation and to assist them in legal and humanitarian matters. 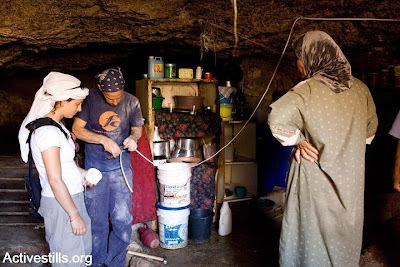 All those efforts however, are also too often foiled by the Israeli authorities, the most recent case being the demolition threat of solar and wind power systems, which constitute the only source of energy for six of the communities, and which were built in coordination with the Israeli initiative Comet-ME. A visit to the communities of South Mount Hebron is also included in some of the tours organised by Green Olive Tours, for further information see here.